On Canada Day, July 1, 1982, Canada's constitution: A constitution is the system of fundamental principles according to which a nation, state or group is governed.constitution finally came home. Although we'd had effective independence from Great Britain since the Balfour Declaration of 1926, our constitution, the BNA Act, still sat on a shelf in London and could not be changed without an Act of the British Parliament. It was quite a day when Prime Minister Pierre Trudeau and Queen Elizabeth sat down outside Parliament Hill and exchanged signatures officially ending this last remnant of our colonial status. As part of the homecoming, we also added a Charter of Rights and Freedoms and an amending formula. But this day had not arrived without a lot of political wrangling. Many conferences had ended in disagreement. Basically, Trudeau wanted Canada to be an association of people. The provincial premiers wanted Canada to be an association of provinces. Quebec wanted to control its own social policies and the western provinces, like oil-rich Alberta, wanted to control their own natural resources. Finally nine out of ten provinces agreed to an amending formula and a charter of rights, but both were compromises which left several loose ends. The big question of how powers should be distributed between the provinces and the federal government was avoided altogether. 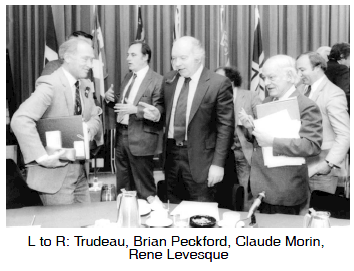 And this appearance of constitutional agreement had a major flaw - Quebec had refused to sign. Bringing Quebec back into the Canadian framework would be a challenge for a future Prime Minister. In the meantime, Canadians had gone through a decade of record inflation: a sharp and sudden rise in prices caused by issuing too much paper money or bank credit.inflation and skyrocketing debt: the total amount a government owes; the accumulation of yearly deficits.debt. They were now in the grip of a serious recession and high interest rates. With a nod to the historic moment of patriation, they turned their attention away from constitutional debate and on to more urgent economic questions.